1 A None No Power Seat 1 A is an Economy Class Bulkhead seat. This seat is designated as a Big Front seat, offering 36-inch pitch and 20-inch width. There is no floor storage during takeoff and landing. The proximity of the lavatory and galley may be bothersome. The tray tables are in the armrests, making the armrests immovable and slightly reducing the seat width. 1 C None No Power Seat 1 C is an Economy Class Bulkhead seat. This seat is designated as a Big Front seat, offering 36-inch pitch and 20-inch width. There is no floor storage during takeoff and landing. The proximity of the lavatory and galley may be bothersome. The tray tables are in the armrests, making the armrests immovable and slightly reducing the seat width. 1 D None No Power Seat 1 D is an Economy Class Bulkhead seat. This seat is designated as a Big Front seat, offering 36-inch pitch and 20-inch width. There is no floor storage during takeoff and landing. The proximity of the lavatory and galley may be bothersome. The tray tables are in the armrests, making the armrests immovable and slightly reducing the seat width. 1 F None No Power Seat 1 F is an Economy Class Bulkhead seat. This seat is designated as a Big Front seat, offering 36-inch pitch and 20-inch width. There is no floor storage during takeoff and landing. The proximity of the lavatory and galley may be bothersome. The tray tables are in the armrests, making the armrests immovable and slightly reducing the seat width. 11 A None No Power Seat 11 A is an Economy Class Exit Row seat that may have additional legroom. However, this seat does not recline. The tray table is in the armrests, making the armrests immovable and slightly reducing the seat width. There is no floor storage during takeoff and landing. 11 B None No Power Seat 11 B is an Economy Class Exit Row seat that may have additional legroom. However, this seat does not recline. 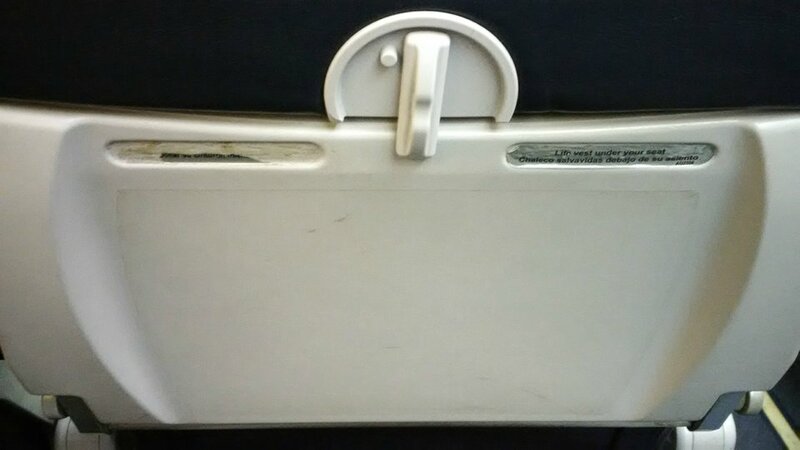 The tray table is in the armrests, making the armrests immovable and slightly reducing the seat width. There is no floor storage during takeoff and landing. 11 C None No Power Seat 11 C is an Economy Class Exit Row seat that may have additional legroom. However, this seat does not recline. The tray table is in the armrests, making the armrests immovable and slightly reducing the seat width. There is no floor storage during takeoff and landing. 11 D None No Power Seat 11 D is an Economy Class Exit Row seat that may have additional legroom. However, this seat does not recline. The tray table is in the armrests, making the armrests immovable and slightly reducing the seat width. There is no floor storage during takeoff and landing. 11 E None No Power Seat 11 E is an Economy Class Exit Row seat that may have additional legroom. However, this seat does not recline. The tray table is in the armrests, making the armrests immovable and slightly reducing the seat width. There is no floor storage during takeoff and landing. 11 F None No Power Seat 11 F is an Economy Class Exit Row seat that may have additional legroom. However, this seat does not recline. The tray table is in the armrests, making the armrests immovable and slightly reducing the seat width. There is no floor storage during takeoff and landing. 2 A None No Power Seat 2 A is an Economy Class seat. This seat is designated as a Big Front seat, offering 36-inch pitch and 20-inch width. 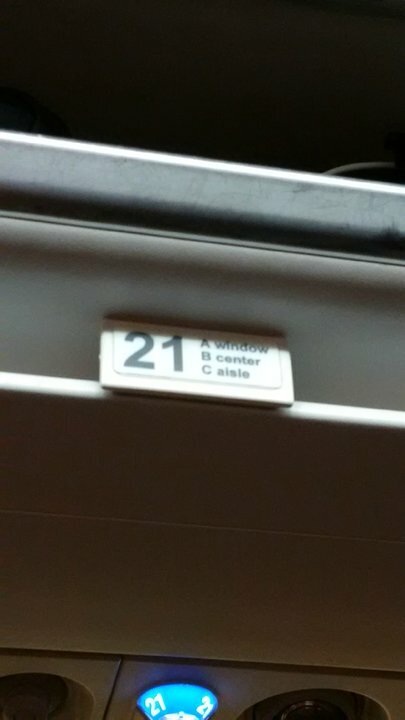 2 C None No Power Seat 2 C is an Economy Class seat. This seat is designated as a Big Front seat, offering 36-inch pitch and 20-inch width. 2 D None No Power Seat 2 D is an Economy Class seat. This seat is designated as a Big Front seat, offering 36-inch pitch and 20-inch width. 2 F None No Power Seat 2 F is an Economy Class seat. This seat is designated as a Big Front seat, offering 36-inch pitch and 20-inch width. 25 F None No Power Seat 25 F is an Economy Class seat located in the last row of the plane. This seat does not recline and has only 28-inch seat pitch, the least amount of pitch of any US domestic carrier. The proximity to the lavatory and galley may be bothersome. You will also be among the last passengers to deplane upon arrival. 26 A None No Power Seat 26 A is an Economy Class seat located in the last row of the plane. This seat does not recline and has only 28-inch seat pitch, the least amount of pitch of any US domestic carrier. The proximity to the lavatory and galley may be bothersome. You will also be among the last passengers to deplane upon arrival. 26 B None No Power Seat 26 B is an Economy Class seat located in the last row of the plane. This seat does not recline and has only 28-inch seat pitch, the least amount of pitch of any US domestic carrier. The proximity to the lavatory and galley may be bothersome. You will also be among the last passengers to deplane upon arrival. 26 C None No Power Seat 26 C is an Economy Class seat located in the last row of the plane. This seat does not recline and has only 28-inch seat pitch, the least amount of pitch of any US domestic carrier. The proximity to the lavatory and galley may be bothersome. You will also be among the last passengers to deplane upon arrival. 26 D None No Power Seat 26 D is an Economy Class seat located in the last row of the plane. This seat does not recline and has only 28-inch seat pitch, the least amount of pitch of any US domestic carrier. The proximity to the lavatory and galley may be bothersome. You will also be among the last passengers to deplane upon arrival. 26 E None No Power Seat 26 E is an Economy Class seat located in the last row of the plane. This seat does not recline and has only 28-inch seat pitch, the least amount of pitch of any US domestic carrier. The proximity to the lavatory and galley may be bothersome. You will also be among the last passengers to deplane upon arrival. 26 F None No Power Seat 26 F is an Economy Class seat located in the last row of the plane. This seat does not recline and has only 28-inch seat pitch, the least amount of pitch of any US domestic carrier. The proximity to the lavatory and galley may be bothersome. You will also be among the last passengers to deplane upon arrival. 3 D None No Power Seat 3 D is an Economy Class seat. This seat is designated as a Big Front seat, offering 36-inch pitch and 20-inch width. 3 F None No Power Seat 3 F is an Economy Class seat. This seat is designated as a Big Front seat, offering 36-inch pitch and 20-inch width. 4 A None No Power Seat 4 A is an Economy Class seat. This seat does not recline and has only 28-inch seat pitch, the least amount of pitch of any US domestic carrier. The tray table is in the armrests, making the armrests immovable and slightly reducing the seat width. 4 B None No Power Seat 4 B is an Economy Class seat. This seat does not recline and has only 28-inch seat pitch, the least amount of pitch of any US domestic carrier. The tray table is in the armrests, making the armrests immovable and slightly reducing the seat width. 4 C None No Power Seat 4 C is an Economy Class seat. This seat does not recline and has only 28-inch seat pitch, the least amount of pitch of any US domestic carrier. The tray table is in the armrests, making the armrests immovable and slightly reducing the seat width. 5 D None No Power Seat 5 D is an Economy Class seat. This seat does not recline and has only 28-inch seat pitch, the least amount of pitch of any US domestic carrier. The tray table is in the armrests, making the armrests immovable and slightly reducing the seat width. 5 E None No Power Seat 5 E is an Economy Class seat. This seat does not recline and has only 28-inch seat pitch, the least amount of pitch of any US domestic carrier. The tray table is in the armrests, making the armrests immovable and slightly reducing the seat width. 5 F None No Power Seat 5 F is an Economy Class seat. This seat does not recline and has only 28-inch seat pitch, the least amount of pitch of any US domestic carrier. The tray table is in the armrests, making the armrests immovable and slightly reducing the seat width. Spirit's A319 aircraft flies in a one class configuration with 145 seats of Economy Class. Spirit Airlines refers to their Economy Class as "Deluxe Leather" seats. Spirit's A319 aircraft feature seats with 28 inches of seat pitch - the least amount of space of all US domestic carriers. Spirit's A319 offers 10 "Big Front" seats which are larger seats at the front of the cabin. These "Big Front" seats offer an additional 6-8 inches of extra legroom and wider seats in comparison to the standard "Deluxe Leather" Economy seats. These seats are available to passengers at an additional fee. i was in 1f big front seat and im 6'2 and im a big guy and the seat was very comfy and i had alot of leg room and the flight was great. We just came back from Las Vegas . Fly out from Detriot and Back . All is well smooth all the way and back. landing was very smooth. seat are clear and better and united and delta really. Staffs are friendly.No problem in Airport, yes there was line up on checkin ,that is experted.I don't know why some time people make so much fuss and negative about this cheap discount airline. Not a problem I will use them again. Thank you Spirit. Sear was good no problem at this seat at all. So many negative comment about Spirit airline. We just travel with this airline,wedo not have any issue with any things. Airline staff are friend. I was very nervous about my flight. I read horrible things about this airline, and some nasty pictures from what appeared to be the plane I was on. Everything was fine! I'm somewhere between 5'7" and 5'8" and about 145lbs, and I was comfortable. Not squished at all. I had the window to rest my head against, and was able to stretch my legs out underneath the seat in front of me. 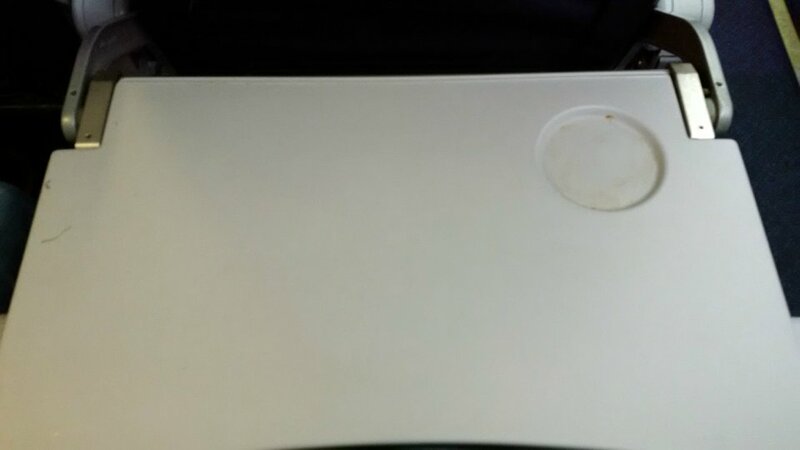 The tray table had a couple stains on it, but the plane was clean for the most part. I'll always chose JetBlue as my #1 airline choice, but this is my new second fav! Beware: big front seats don't recline. What people fail to understand is that they are not hiding anything. Seats are tight but so was my coach seat on a british airways 747 last week. You get what you pay for...nothing more, nothing less. Food prices are not out of line and i have never been on a "filthy" spirit plane. Quick turn around, yes...cleanest in the world, no. People...this is not the 1960's anymore and we dont dress for an epic flight journey. Its transfortation...thats it. As long as its safe, i'm good. I found seatguru after I had booked with Spirit, and was dismayed at the negative comments about seating, so we paid extra to get exit row seats (the "big front seats" were gone by then). We were surprised to find more space on this plane than we've seen in most airlines lately. Our exit row seats had plenty of legroom of course, but even tall men sitting in regular seats on the plane weren't kneeing the seats in front of them. On the second leg of our flight, a shorter time, we sat in regular seats and still had several inches between our knees and the seatback (we're both 5'9"). Our American flight on the way out was MUCH tighter, with absolutely no knee room at all. The Spirit seats were too narrow, but no more so than any other flights we've been on, and the seat padding was comparable to others also (meaning, I wish there was more of it!). The aisles were wider than other flights, making it easier to get on and off, and not having beverage service meant there was no cart clogging up the aisle, so people could stand and stretch, or easily make their way to the restrooms. All in all, we were very pleasantly surprised, and will use Spirit again. This doesn't mean airline travel is comfortable by any means, just that Spirit was as good as others and better than some, and had a much cheaper price. Regarding cleanliness (as one of the other reviews complained), our flight was perfectly fine, no problems. I'm pretty sure row 24 has slightly smaller pitch than the other rows (at least DEF do). I thought I could see a visual difference, and my knees hit the seat in front of me no matter how I tried to sit (5'8"). On the flight back, I was placed in row 21 and my knees didn't have a problem clearing the seat in front of me. Person next to me kept complaining about the seat too. Knowing that Spirit Airlines has the smallest pitch in the airline industry, I selected an Exit Row seat, 11C. At 6'0" and 250, the seat had plenty of leg room. With the seats not able to recline, I didn't have to worry about them hitting my knees. I did find the slightly more narrow width of the exit row alittle confining but not problematic. Great experience, Big Front Seats are the way to go! Comfortable, lot's of leg room. Not nearly as bad as what I'd heard about Spirit. Workers were friendly both on and off the plane, on time, both to and from Chicago O'Hare. Will fly again. Definitely worth the extra price for the Big Front Seats. We paid an extra $25 per seat each way for rows 1 and 2. Plenty of room, comfortable and the front 2 rows do recline. We paid more for 3 total carry ons than the seat upgradse. That's the way to go. Tolerable for a 1 hour flight from LA to Vegas, but I couldn't imagine flying with them on a flight much longer than that. The fares are very cheap (I paid $29 to go from LA to Vegas), but they only allow one carry-on before charging you extra, and by that point, their fare is oftentimes comparable to Southwest which is a much more comfortable experience. As others have said, it was a very tight fit, and I am a small person - 5'6 130 lbs. The seats don't recline, and on the plane I was on, they were only coated with a thin layer of leather, like a city bus. They do provide good value if you are on a short flight with out much luggage, but if you need any more than that, I would suggest flying somebody else. The new non-reclining slim seats offer significantly more leg room on the A319 than is being reported. Even more than many legacy carriers seats. I understand that it's a low-cost airline, but it's positively cramped and filthy. I'd much rather pay more money for a flight knowing that the aircraft will be slightly more roomy and clean. I'm wondering how we've come to this. In case of fire/crash how can the regulators believe people could find their way out. We're cramed in so tight it's unsafe. It's always that WHAT'S BEST FOR BUSINESS attitude. You have got to be kidding!! I am 6'2" tall and weigh 260 pounds and I was crammed into a seat that was better suited for an 8 year old who weighs 80 pounds. I can see why your flights are so cheap. You cram as many people in your aircraft as you can regardless of comfort. I can also see why people say they flew on your aircraft once and that will be the last time. I know I will pay more for a flight that will tell me up front what I have to pay rather than wait until I am ready to get my boarding pass to inform me of all the extra costs for an adventure that if I had known what I was in for, I surely would have backed out. Stop complaining! Where else can you get a ticket from Dallas to Philadelphia for $43? Yes the seats are tight (a 3" difference from Delta or United) and you have to pay for drinks and snacks (you can buy your own prior to boarding if you can't take 4 hours without eating). I am 6'2" and have to sit upright, its not so bad to save all this money. This was the worse plane I have ever flown on. It was so tight being 6'3 and I felt so crowded in. It is a shame that people buy into this airline, I hope it fails. Flying American after this, I was thankful for what American has to offer. Exit row but its does not recline. None of the seats on this Spirit flight recline! Felt narrower than the average exit row seat. I always buy exit or Big Front when forced to fly Spirit. I'm 6'4 and don't physically fit in the regular seat and have to sit with my knees turned. Exit is the best of the worst. OMG. This was just the worst airline I have ever flown with! It was only about 3-4 hours but it felt like 7 hour nightmare!! The seats DO NOT RECLINE AND THE LEGROOM IS HORRIBLE. Filthiest Plane I have ever seen for a US Airline. They nickle and dime you for EVERYTHING. 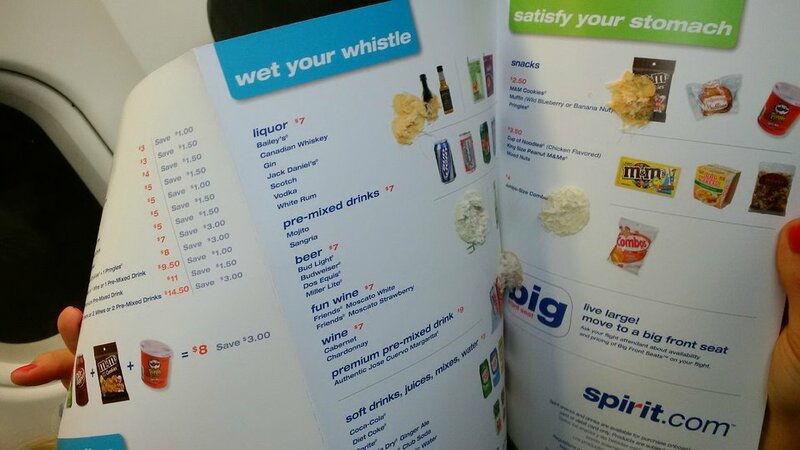 I did not buy anything on the plane because after seeing this planes filth I did not trust anything, the lavatory had poor lighting plus the floor and toilet had spots of grime all over. I flushed the toilet with a plastic bag on my hand and never used the sink (I used my own hand sanitizer). Anyways just never fly Spirit Airlines EVER! I flew with this Aircraft in May 2014 from Houston from Minneapolis because it is the only non-stop flight on this route. I'm 6"2" and the leg room is not enough, I had always had to sat crooked. The floor was not very clean und most of the seats were dirty too. Fortunately we were only 2 persons in this row so i was able to put my feet in the leg room of the middle seat. I would not recommend to fly with Spirit airlines. I will never fly with this Airline again. I flew from Denver to Ft Lauderdale. About a 4 hour flight. My seat was in front of the exit row and did not recline. It was small and incredibly uncomfortable. I am 5" 6" and 150 lbs. On the return flight I sat one row forward and that seat did not recline either. Apparently none of them do. This flight was $200 cheaper than any other airline and the only direct flight from Denver to Ft Lauderdale. I have flown a lot and this was the most miserable, uncomfortable seating ever. This was a very uncomfortable flight. I am not tall (5'10"), and my knees were bumping the seat in front of me. Not to mention that every time the person in front of me moved, my tray table would shake uncontrollably. Although, the flight was cheap, extra money was spent for carry on bags and checked bags... If it wasn't for the movie that I had on my iPad, the flight would have felt way longer than the 4.5 hours. I should have flown Southwest or Delta... Never again will I fly Spirit for a flight longer than 2 hours. Big front seats are very comfortable. Glad we paid the extra $$, it was worth it! I'm 6' 255 lbs so I'm a little larger than average, but not terribly. I reserved the exit row seat to make sure I had enough leg room. There was sufficient leg room, however the seat itself (front to back) was short - like sitting on high school bleacher seats. Wasn't long into a 3 hour flight that it became very uncomfortable. And with Spirit's policy that you can not stand, other than to get to the lav, it was an unpleasant flight. I found the seat pitch objectionable to anyone taller than 5'10" as your knees will be crammed into the seat back in front of you. The seats on this flight are very narrow. I wear a size 38 jacket and my shoulders were about as wide as the seat. They're also way too close together. I'm 5'11". When the person ahead of me reclined his seat, it hit my knees. Spirit flies 1 versions of Airbus A319.